From 4-5 March 2013, representatives of the monks of the Australia and New Zealand Diocese met together in Dandenong for a period of fellowship in support of their shared monastic life. A majority of the monks of the diocese were present for the period of prayer, reflection and fraternal fellowship. 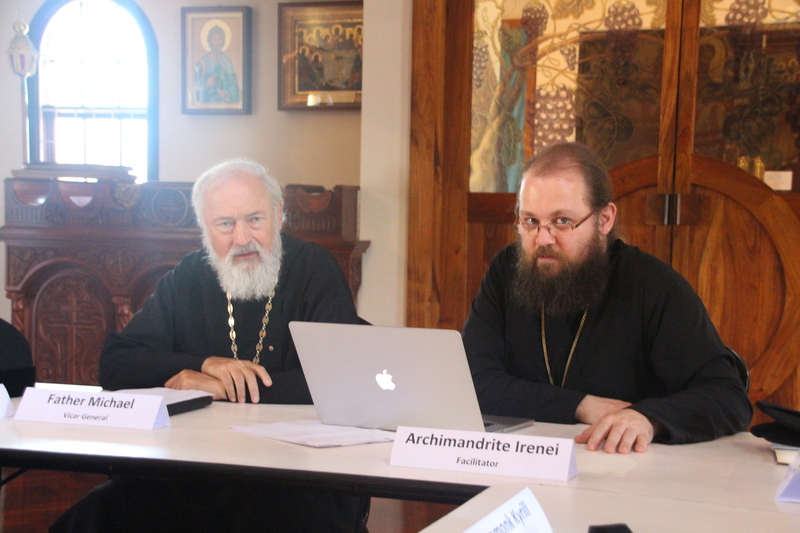 At the invitation of the diocese’s senior monastic and spiritual father, Metropolitan Hilarion, Archimandrite Irenei of San Francisco travelled to Australia to join the diocesan monastics, offering a series of talks on the role of the monk in the diocese, the monastic life as an apostolic and angelic calling, and other themes; as well as leading discussions amongst the fathers. 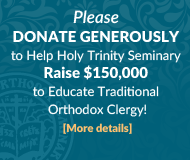 Accepting as a first priority the strengthening of their zeal for their monastic calling, the monks of the diocese valued the rare opportunity to come together to create a stronger sense of fraternity and cooperation among themselves. Taking full account of the grave challenges facing the faithful in the world today, they reflected on their mission to the Church through lives of repentance, prayer, obedience and a living embrace of the Church’s witness of Christ into society. 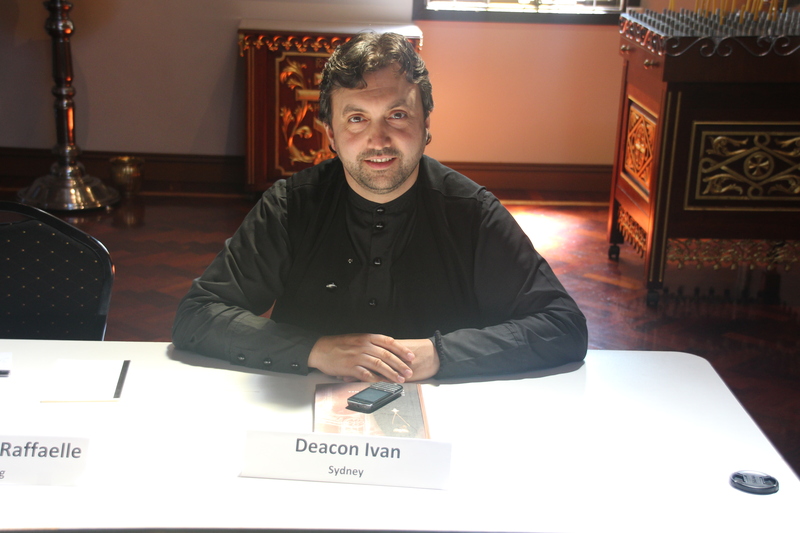 Aware that distance and other challenges keep the monastic communities of Australia and New Zealand fragmented geographically, the fathers expressed their commitment to being united in mission, prayer and an untiring witness to the singular voice of humility, charity and love that the monastic life seeks to speak into the world. Concluding their time together with a concelebrated moleben and Akathist Hymn to the Mother of God, served in the parish church of Our Lady’s Dormition in Dandenong, the fathers departed with a firm intention to meet again next year, beginning a pattern of regular gatherings, ensuring that in future those fathers not present this year would also be able to participate, as well as the female monastics of the diocese. 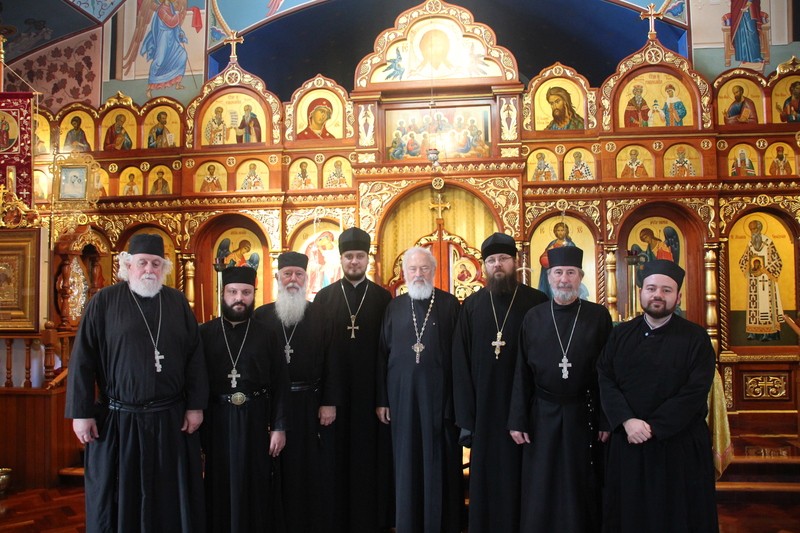 Thanks were offered at the conclusion of the gathering to the Vicar-General of the Diocese, Mitred Archpriest Michael Protopopov, for the role he played in organising and hosting the conference, also to the Sisterhood of the Dandenong parish for their culinary delights and the Russian Welfare Society for providing accommodation for our interstate brethren. Greetings in the love of Our Lord, God and Saviour Jesus Christ! 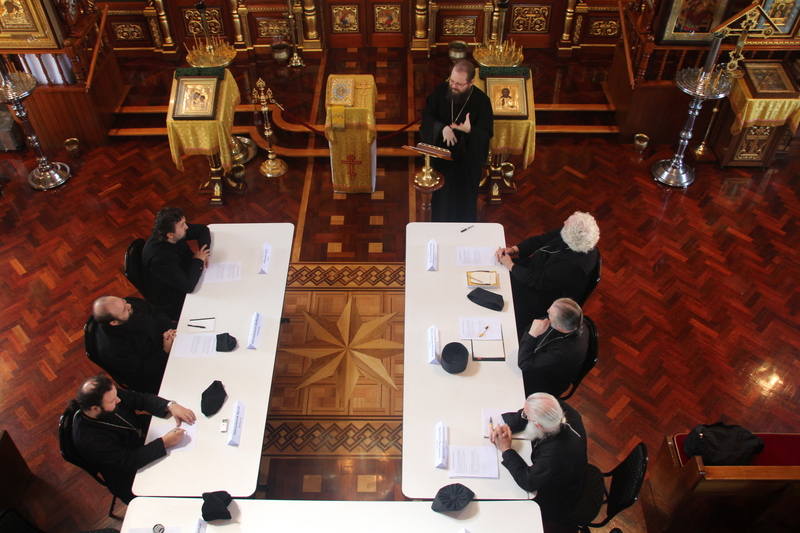 Called together by the Holy Spirit through the voice of our Metropolitan (Circular Notice Nº 1-8-13), we, as unworthy representatives of the monks of the Australia and New Zealand Diocese of the Russian Orthodox Church Outside of Russia, gathered together in the city of Dandenong, in the Church of Our Lady’s Dormition, from 4-5 March 2013, in order to confer as brethren for the support of our monastic life and calling. Though few in number, we felt ourselves part of the living Body of the Church, which is Christ’s, and spent our common time in prayer, learning and spiritual discussion. 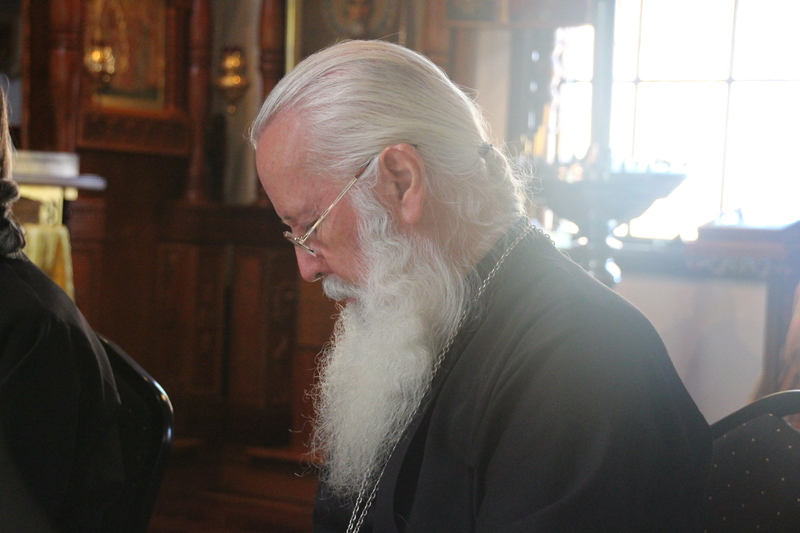 Archimandrite Irenei of San Francisco was able to be with us throughout our two days, leading us in reflections on our shared heavenly calling, and praying with us for the strength of our fraternity. Brethren! Our brothers in Christ’s ministry and pious faithful of the Diocese: we speak to you with one voice and with heartfelt love as we stand at the threshold of the Great Fast. Our lives, though often filled with turmoil and struggle as we strive to fulfil our monastic calling, are yet one and shared, and we are brethren of a common angelic hope. We thank our God that in His mercy He has made of us, diverse and broken men, one spiritual brotherhood united across the whole of these lands, living in distant communities and hermitages yet united in spirit, mission and fraternal love; and as we were fed by mutual counsel and prayer, our hearts burned with the desire to share with you, our faithful brothers and sisters in Christ, our deep love for you, for our Church, and for our common Christian calling. And as we approach this time of universal repentance in the Church, we speak to you as with one mouth and with one heart from the midst of our struggles: Rejoice! Let us together take heart and find deep solace in the season of repentance the Church now places before us. We offer you our prayers, though they are unworthy; and we assure you also that our lives, offered — however imperfectly — to the Church, are offered also for each of you, and we hold you in our hearts, our minds and our daily commemorations. We recognise that we live in an age of lost spiritual values and diminished Christian virtue, and we call upon you to join us in bearing witness to Christ in this world and proclaiming His relevance in the lives of today’s unbelieving generation. May our witness to the world be strong, united, untiring and filled with a true love for all of God’s creation. May Our God, who in His inexpressible love has called our monastic fraternity together over these days, draw all of us in the Church ever more towards His Kingdom and towards one another. We implore you to remember us all in your prayers, and assure you of your place in our hearts as we approach together the great Resurrection of our God.